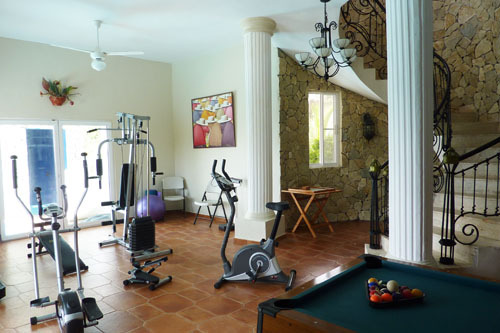 The villa has recently been constucted and is of the highest quality with lavish marble,granite and stonework. 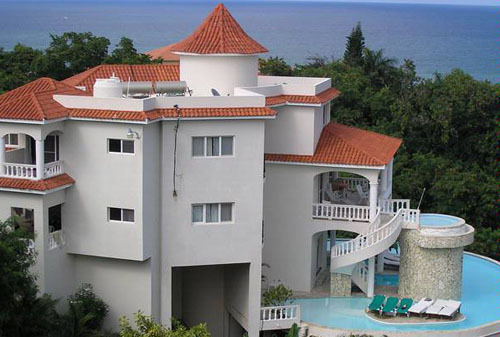 Located in the desirable altos de Cofresi it overlooks the Cofresi beach complex and has far reaching views along the entire north coast. 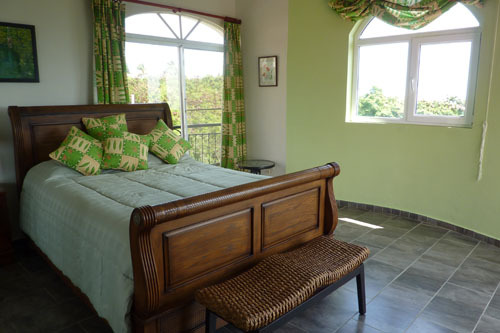 The villa has 6 large bedrooms all ensuite luxury bathrooms, A/C,fans balconies,tv and telephone outlets. 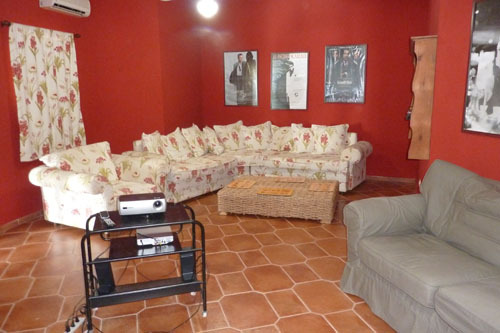 Main living area has mezzanine floor with 16ftx 12ft mural and 3 walk out doors to large balconies and hot tub. The games complex (billiard table,ping pong, footbal game etc) has a fully equipped gymnasium (6 pieces) and seperate cinema with projector. 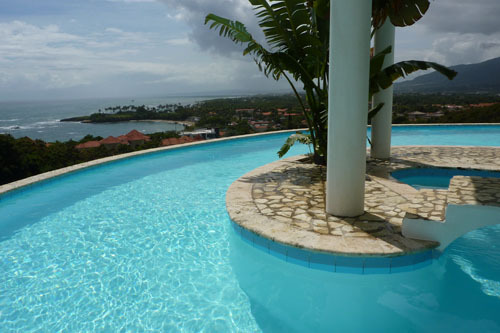 The infiniti swimming pool (60000 gallons) has two islands with bridge and uses all commercial pool fittings. 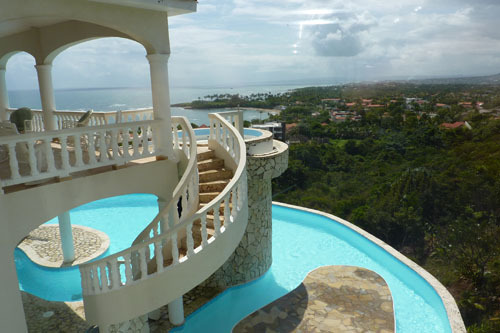 The heated jetted pool in on the main living area floor has a waterfall that cascades down to the main pool and a seated grotto is a seperate stone spiral staircase from the 2nd storey pool to the main pool. 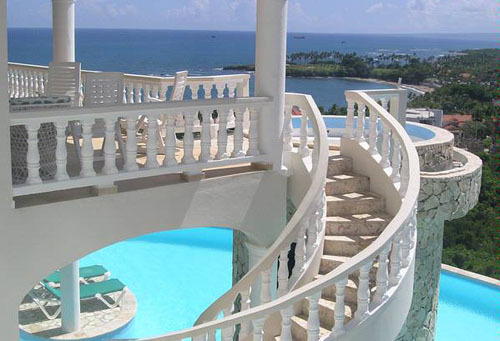 The central spiral staircase in the villa is in natural stone and wrought iron covers 5 stories and on the top story is an observation balcony on the lower storey is a wine cellar. 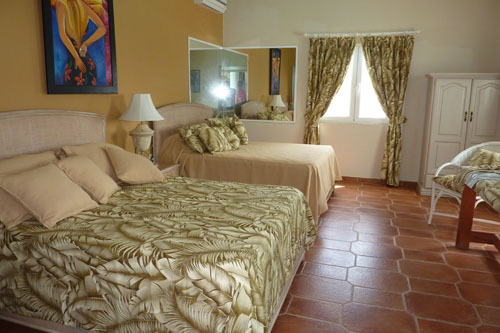 The villa is totally furnished and equipped to a high standard and is presently being rented on a weekly basis. 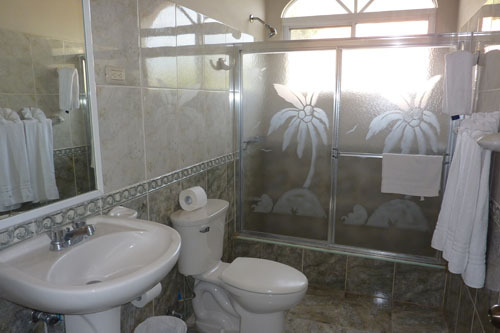 Kitchen is fully equipped with granite work water is supplied by solar heating 1 for each living and high speed internet are connected. 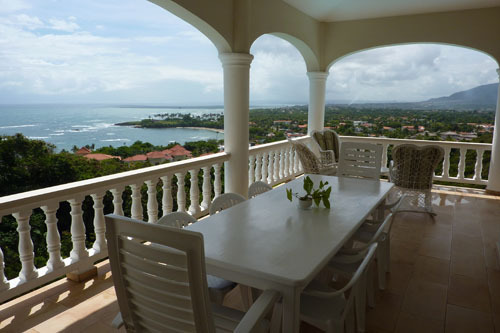 the villa has extensive imported german double glazed windows and doors. This part of Cofresi has almost uninterrupted power supply. Owner is motivated bring all offers!! !